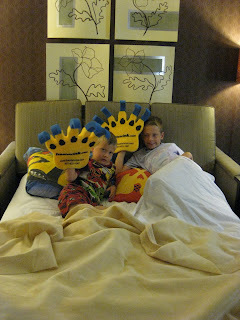 In Las Vegas we stayed in a suite that had a bedroom with a king sized bed and a convertible sofa sleeper in the living room. 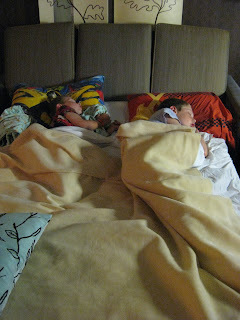 Wise parents that we are, we excitedly told the boys that they got to sleep on a "Transformer" bed. They are currently obsessed with Transformers toys, so they were pretty excited when they heard this. When we pulled it out to make it into a bed or put it back into the couch, Mike made the requisite sound effects to go along with the transformation. They thought it was pretty cool! 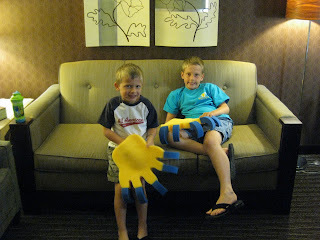 The foam hands are some of the neat goodies Mike brought back for the boys from the LDI conference he was attending.